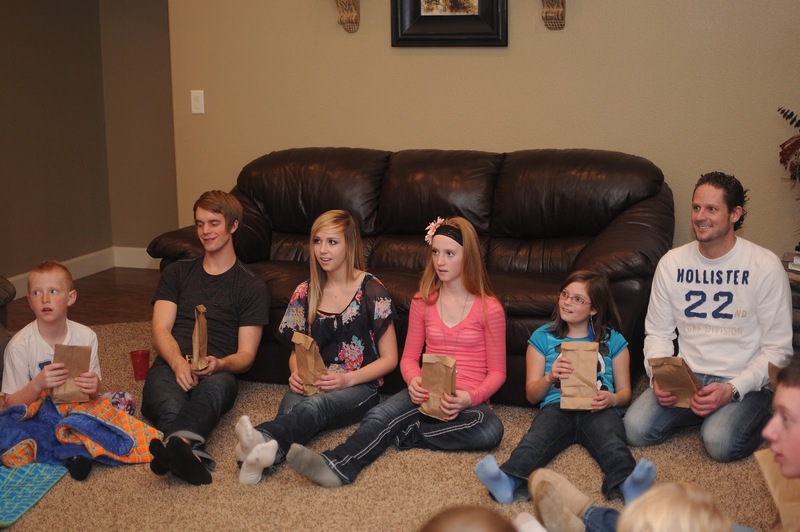 Ever since we became a family, we've had basically the same traditions for our Christmas holiday. 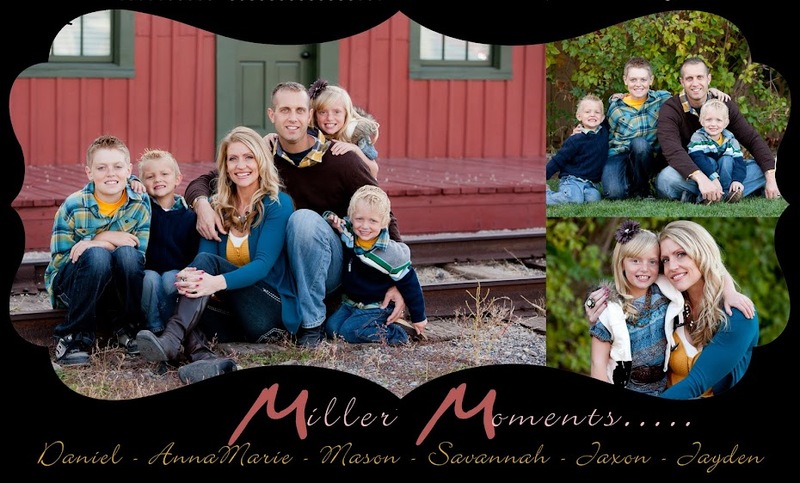 Besides a couple of Christmases when Mason was just tiny, we've lived very close to our families most of our lives. And those years when we didn't, we were a small enough family that it wasn't all that difficult to pack up and go home for the holidays. This year, we weren't quite sure what we were going to do for Christmas. This was our first holiday season in our new home. 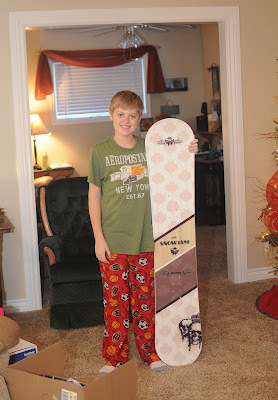 We've been thinking about starting some new traditions, now that our family has grown and our kids are getting older. The thought of packing all 6 of us up, including all our presents, stockings etc, and driving to another state for Christmas, was not all that appealing. And yet, to our children, Idaho still felt like home. It was important to them that we be there for Christmas. So, in spite of the work involved, we decided to go ahead and make the journey. Next year, when the kids aren't missing their Idaho friends and family quite as much, we might stay here in our own home and enjoy the holiday. A few days before Christmas- we packed up EVERYTHING you can imagine. We played vehicle Tetris and were able to fit all our crap everything in the car. I was thanking the heavens that we bought the Escalade before this trip, since it has so much more cargo room than our Expedition did. There is no way we could have fit it all! The kids were bursting with excitement to see their friends. 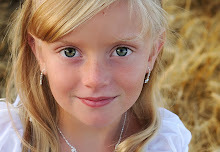 Savannah spent the first day in Idaho with the twins, Maycie and Taylie Ard (her best friends since they were babies). One of the hardest parts of our move was leaving them. They are the closest thing she has to sisters. 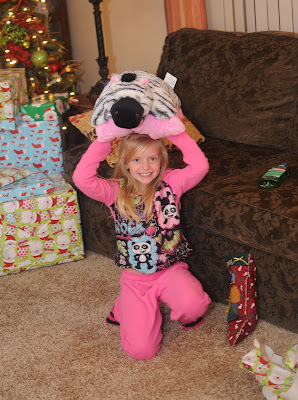 She had a wonderful time catching up with them and exchanging presents. We love those girls! 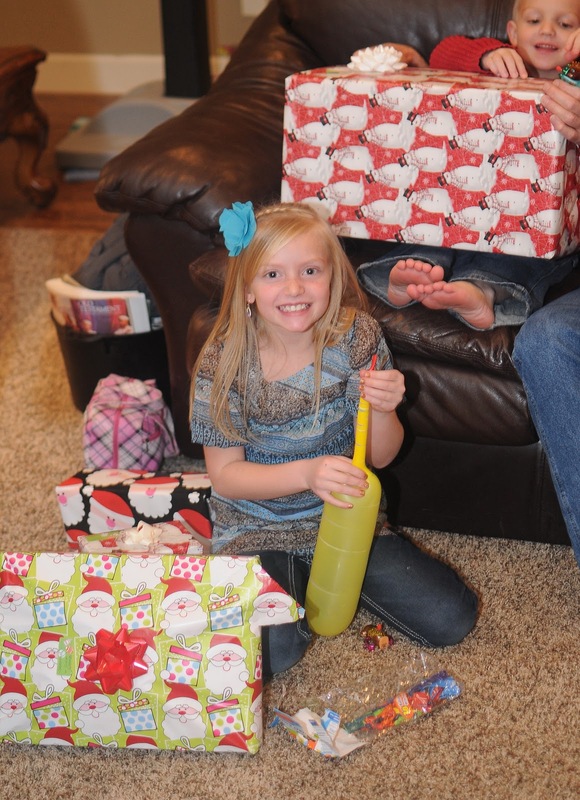 Christmas Eve- Christmas Eve is "The Main Event" with the Miller clan. We all gathered at David and Dana's (Dan's brother) house. We have delicious food (way toooooo much of it, as my post-holiday waistline will attest) and play some of the same games each year. 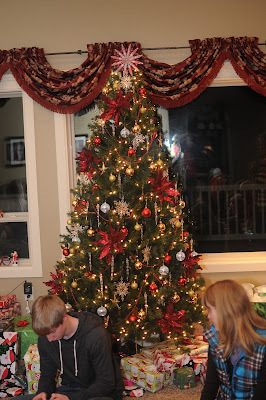 The kids open their presents from Grandma and Grandpa and then we eat some more food. Later on, we play some board games and eat some more food. After that, we finish up by eating some more food :) When the clock struck "too late for kids to still be awake", we packed it all up and went back to Dan's parents house and put the kids to bed. 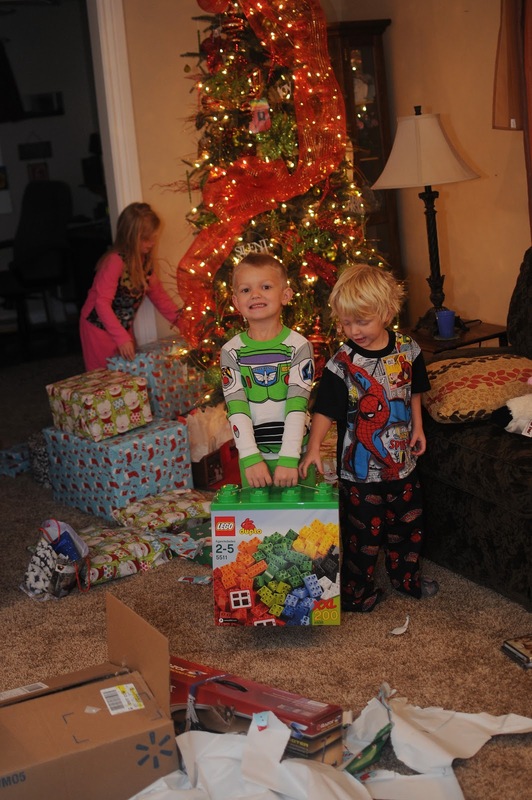 Each Christmas eve, we also let the kids open one present-their new pajamas. We did this, and then Savannah (who is clued into the whole Santa thing) and I finished up pre-Christmas duties and put everything under the tree. It was a perfect way to spend Christmas Eve. 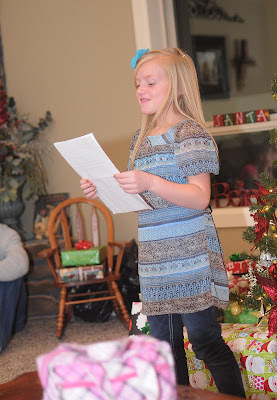 Savannah was asked to read a sweet story to the family on Christmas Eve. She did a great job! 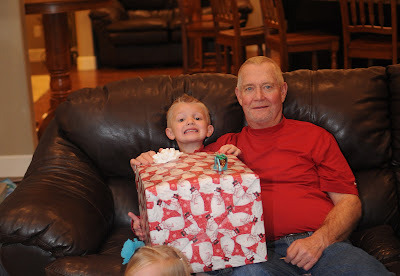 Christmas Day- Usually, we open our presents in the morning and then visit my parents and spend a little time with them on Christmas. However, this year, my parents flew to Alabama to spend the holiday with my sister Rachel and her cute family. Our kids were up bright and early, ready to open thei presents ( I know this is a shocking fact). And that's just what we did! The kids were thrilled with their gifts. And then.....then we just enjoyed each other. We just chilled. We soaked in the beauty of being together as a family and enjoying the Christmas holiday. 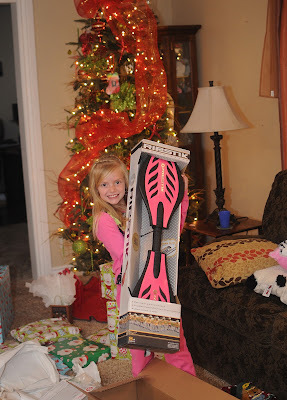 Ooooh- it's a pink Ripstik! Do you know that even when the other colors go on sale, the pink one doesn't? What's that all about? Mason with his brand new snowboard! We spent a few more days in Idaho before heading back home to Utah. I did a little after Christmas shopping and picked up a new tree for next year. All in all, it was a very relaxing, enjoyable trip. I wasn't sure we would be able to get everything back in the car for the drive home, but we made it (with the exception of the tree- which I did have to leave!). As a family, we are so blessed to have each other. 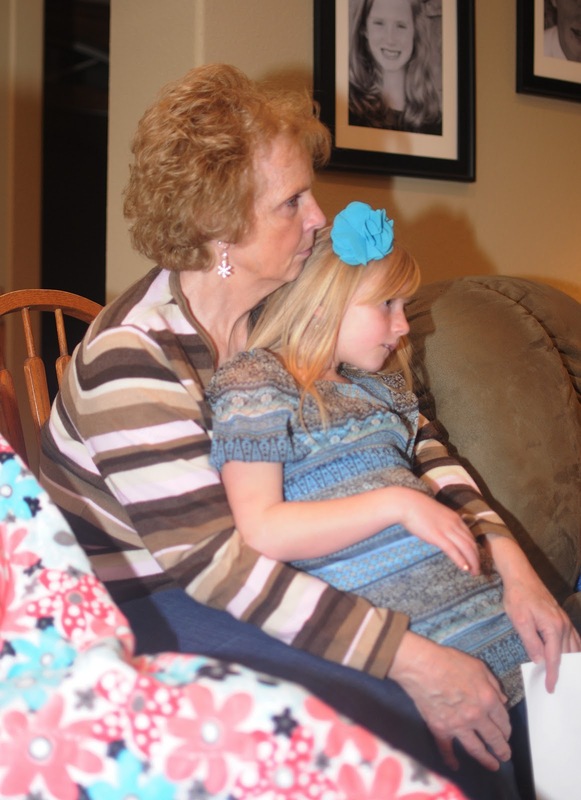 Although we have moved to another state, we are still close enough to visit quite often, and see those we love. Our time together is priceless. Soo fun!!! Love all the pictures!! We are hoping to pack up and go to California this Christmas. We haven't been there for Christmas since I was 2 months pregnant with Crew. Being with family is the BEST! !